The terrorist attack on the Twin Towers in New York in 2001 was not the first ’9/11’. In Chile, on 11 September 1973, a bloody coup, led by General Augusto Pinochet and backed by the US administration, overthrew the democratically-elected, Left government of President Salvador Allende. In its aftermath, thousands of trade unionists and socialists were slaughtered and thousands more imprisoned, tortured and exiled. On the fortieth anniversary of the coup, Chile is embarking on a new presidential election scheduled for 17 November 2013. Following a massive student movement, which has continued to rock the country, the first possible important steps are being taken to rebuild an alternative for the working class. The two main political blocks, the ‘New Majority’ and the ‘Alliance’, both represent the existing ruling elite. They have offered no alternative for the working class and poor of Chile. The parties of the “left”, like the Socialist Party and Communist Party, have long since abandoned the radical left ideas they adhered to during the Allende-era. Like there counterparts internationally, these parties have embraced capitalism and the market and offer no alternative to the working masses. Former President Michelle Bachelet of the Socialist Party and New Majority coalition is standing again, as no other credible candidate emerged from the former governing coalition. Bachelet is the daughter of air force General Bachelet, who supported Allende and died under torture following the coup. The right-wing Alliance is fielding Evelyn Metthei, daughter of former Pinochet junta member, General Matthei. Neither candidate offers anything but a continuation of neo-liberal policies. Yet also running in this election is Marcel Claude, the candidate of the Humanist Party and Left Alliance. Defending the students’ movement, demanding free quality education for all, and re-nationalisation of the copper industry, banks and big monopolies, Claude’s campaign has drawn big crowds and won enthusiastic support from workers and young people. The campaign represents an important step forward in re-building the workers’ and socialist movement. To build on this and to take it forward following the November election, the lessons from the bloody coup 40 years ago need to be learnt by a new generation. The reasons for the defeat 40 years ago are relevant for the workers and youth of Chile and all countries. To read about the background to the coup and the lessons workers and youth must draw from it, we are re-publishing, ‘The other 9/11 – 1973 bloody coup against Popular Unity government, lessons for today’, by Tony Saunois, written in 2011. The September 11th 1973 coup in Chile was planned and executed not from the tribal territories of Afghanistan or Pakistan but in the head-quarters of the CIA and the White House, in collusion with the ruling elite in Chile and its armed forces. This 9/11 should be commemorated, and its lessons studied, by socialists and workers everywhere. No US presidential apology, including by Obama, has ever been made for what was unleashed on the workers, students and ordinary people of Chile. The consequences of what followed still shape the lives of the mass of Chilean people. The aftermath of the attacks on the Twin Towers are felt by workers and the poor in Iraq, Afghanistan, and Pakistan and around the world. What followed the coup in Chile also had consequences for the international working class and all those exploited by capitalism. Under the iron heel of Chile’s military dictatorship, a laboratory economic experiment was conducted. The neo-liberal policies of privatisation, open markets, de-regulation and private pension schemes were all first tested out in Chile following the coup. They were then applied in the 1980/90’s and continued in this new century, by the ruling classes internationally. The ‘Chicago Boys’, economic students of Milton Freidman, arrived in Chile in the aftermath of Pinochet’s coup. The military regime gave them a free hand to test out their theories. These were the policies later to be pursued by Thatcher, Reagan and other capitalist leaders. The PSCh in that period was a completely different animal to that which exists today. Formed in the early 1930’s, it was born in opposition to the Stalinised Communist Party, and was a larger party. It was far to the left of the PCCh. It included in its constitution adherence to Marx and Lenin and called for the establishment of a Socialist Federation of Latin America. Allende, although in many speeches endorsing Marxism, was not the left candidate for the PSCh but was the party’s ‘compromise’ candidate for the presidency elections. The victory of the UP followed a series of social upheavals which rocked Chile during the 1960’s. The middle class was split with a section becoming increasingly radicalised. This affected the centre-right capitalist party, the Christian Democrats (DC). A section eventually split and formed the Christian Left (IU) and the MAPU, which ended up in the UP and even on its ‘left-wing’. Even Tomic, the DC’s candidate against Allende, reflected this process by endorsing the “relevance of Marxism”. Within weeks of forming the government, the Popular Unity (UP) introduced important reforms. Free schools meals were decided straightaway, wages were raised and land reform began to be implemented. Under the impact of the revolution, the powerful copper mines, largely owned by US multinationals, were eventually nationalized, along with important sectors of the banks. Plans were announced for the nationalisation of nearly 100 companies. By the time of the 1973 coup, over 40% of the economy was in state hands. From the beginning, the Chilean right wing and the military, together with US imperialism, began to plot the overthrow of the UP government. Initially, they hoped that a policy of de-stabilisation and economic sabotage would be sufficient to undermine the new government and trigger its down fall. American President Nixon’s orders were “to make the economy scream”. A trade embargo against Chile was established. These forces of reaction financed armed terrorist attacks by the fascistic ‘Patria y Liberdad’, and a bosses’ lock-out was led by truck owners. 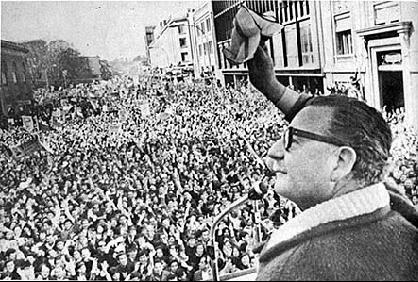 Allende won the election with 36.3% of the popular vote. The capitalist parties in the Congress allowed him to take the presidency, on a minority vote, because he fatally agreed to a constitutional pact that meant he was not to touch or interfere with the armed forces. This was to prove disastrous, as events unfolded. The ruling class hoped that they could undermine Allende’s support and rally their supporters and those who were wavering. At first, they attempted to do this “constitutionally”. They used the Congress and Senate to block and disrupt the government. Eventually, they hoped to impeach Allende, for which they needed a two-thirds majority, but which they failed to obtain. The undemocratic nature of the parliamentary system meant that the UP did not have a majority in either Congress or Senate. However, this policy rapidly began to unravel as electoral support for the UP not only consolidated but increased. Every attempt to undermine the government radicalised the working class, pushed the revolutionary process forward and increased electoral support for the government. During the 1971 mayoral elections, UP candidates took over 51% of the vote. Even at the Congressional elections, in March 1973, the pro-capitalist parties hope to win 66% of the vote and two-thirds of the seats, which would have been enough to impeach Allende. They failed and the UP won over 44% of the vote – more than when Allende was first elected! Unlike Venezuela today, the working class consciously saw itself as the leading force in the revolution in Chile. While Allende enjoyed enormous popularity, the personality cult and top-down administrative methods, present today in Venezuela, were not predominant under the Popular Unity (UP). In Chile, the working class had built a series of powerful political and social organisations with a long history and tradition. There was intense debate between the different organisations and parties, and also within them, about programme and strategy. The leaders were challenged and, on occasions, opposed by workers. Where the old organisations proved inadequate, the workers built new ones that were more responsive to their demands and needs in the work places and the local communities to lead and defend the revolution. The character of the revolutionary process under the UP had a massive effect internationally. This was far greater than the sympathy shown by layers of young people towards Chavez in Venezuela. The election of a “Marxist” President and government in Chile, and the leading role in the process of the working class, enthused the working class globally. It also opened a discussion on how to achieve socialism and the role of the state. In Britain, meetings of the trade unions and the Labour Party debated the Chilean experience and its lessons for the workers’ movement internationally. Supporters of Militant (the forerunner of the Socialist Party) moved resolutions for the Labour Party congress, drawing on the lessons of Chile and, amongst other things, demanded trade union rights for the Chilean armed forces. Every attempt at counter-revolution in Chile provoked a further radicalisation and mass mobilisation by the working class and its allies. The bosses’ strike in 1972 led to the rapid growth of organisations in the industrial districts and the formation of the ‘cordones industriales’ (‘industrial belts’). These were elected committees in the work places, which began to link up on a district and even a city-wide basis. Delegates were elected and subject to recall. In the industrial city of Concepcion, in the south of Chile, they formed a city-wide Popular Assembly. Workers’ control was established in many workplaces throughout the country. Food shortages and speculation caused by the embargo and sabotage of the bosses resulted in the formation of the JAP’s – ‘peoples supply committees’ – which organised food distribution and tried to prevent speculation. The cordones increasingly assumed a political role to advance and defend the revolution. This was partly driven by the frustration of workers at the undemocratic parliamentary election system, which meant that the UP lacked a majority in the Congress and the Senate, despite forming the government. One of the most radical of the cordones was in the industrial district of Cerillos. It adopted a political programme that, amongst others things, declared “support for president Allende’s government, in so far, as it interprets the struggles and demands of the workers; expropriation of all monopoly firms with more than 14 million escudos in capital or are of strategic importance to the economy; workers’ control of all industries, farms, mines, through delegate councils, delegates being recallable by the base; a minimum and maximum wage; peasants’ and farmers’ control of agriculture and credit and to set up a Popular Assembly to replace the bourgeois parliament”. The working class, were far to the left of the government and its leaders, both of which were dragged into taking more radical steps by the radicalized workers and youth. In response to the armed attacks being unleashed by the fascistic Patria y liberdad, as the police and army stood by, workers’ defence squads were formed. These developments terrified the ruling class and imperialism. The revolution spread to the countryside, where farm workers and peasants occupied land and carried out a programme of agricultural reform. Over 10 million acres of land were re-distributed. The ruling class, in conjunction with US imperialism, began to rapidly develop plans for a military coup as the prospects of ousting the Allende government through parliament diminished and the revolutionary process continued to advance. Yet, at every stage, the leaders of the PCCh (Communist Party) and sections of the PSCh (Socialist Party) acted as a brake and tried to hold back the revolutionary process, arguing that the “democratic” bourgeoisie must not be alienated and defended the “constitutonality” of the armed forces. The left of the PSCh, including figures like Carlos Altamirano, the party’s General Secretary, argued for the creation of “Peoples Power” and the strengthening of the revolution. However, despite using very left-wing revolutionary and Marxist rhetoric, the left of the Socialist Party failed to propose specific demands or initiatives to take the revolution forward and to overthrow capitalism, while plans were being laid for a reactionary military coup. These developments led to a polarisation within the Popular Unity (UP) coalition and splits within its component parties, between the left and right. Yet the forces of reaction laid out very detailed and precise plans. Henry Kissinger, US Secretary of State in the Nixon administration, cabled the CIA chief in Santiago: “It is the firm and continuing policy that Allende be overthrown by a coup.” The preparations were laid. Reaction bided its time, waiting for the appropriate moment to strike. It was known throughout Chile that a coup was not only being discussed but planned for. At the time, it was joked that Allende spent 23 hours out of every 24 hours worrying about the army. In June, sections of the military, from the tank regiments, moved prematurely and organised a rebellion against the government – the so-called ‘Tancazo’. It was too early and was put down by the military, under orders from Allende. General Pratts, a supporter of Allende, who quelled the attempted uprising, was later murdered after the successful coup in September 1973. The ‘Tancazo’, in June, acted as the whip of counter-revolution and provoked the working class to take further revolutionary measures. It had the same effect as Spinola’s failed putsch, a few years later, in March 1975 during the Portuguese revolution. In Chile, the failed June coup was followed by the announcement of a plan for massive nationalisations and by an increasing demand by the working class for arms to fight the threat of reaction. Yet despite the ‘Tancazo’, neither Allende nor the other leaders took steps to strike against the military or to mobilise and arm the workers. Trade union rights were not given to the ranks of the army, no attempt was made to try and organise or to build support amongst the ranks of the armed forces, many of whom supported the revolutionary process. The conditions existed to split the armed forces but decisive action was necessary. Yet the leaders of the UP were imprisoned by the idea, especially emphasized by the Communist Party, that a “progressive wing” existed amongst a section of the ruling class. Allende proclaimed his determination to avoid a civil war. They had a policy of respecting “the constitutionality of the armed forces” and of a gradual measured step by step programme of reform that, eventually, would establish socialism. In practice, this ‘stages theory’ allowed the ruling class time to prepare its forces to strike, when the moment was most opportune. It resulted not in the avoidance of a civil war but in the drowning of the revolutionary movement in blood. From the beginning, Allende laid the ground for his own defeat when agreeing not to touch the army in the fatal ‘constitution pact’. The state machine was left in the hands of the generals and reaction, without any challenge. Allende adopted a policy of appeasement – even of appointing three generals – including Augusto Pinochet to the Cabinet, in a doomed attempt to reassure the military and ruling class. Allende had the support of four out of twenty two generals but his policy rendered him impotent, as his supporters were systematically removed and eventually executed. The Republicans in Spain, in the 1930’s, playing ‘musical chairs’, at least moved Franco around the country, to try and prevent the organization of the fascist military revolt. But Allende made Pinochet a Cabinet minister and even Chief-of-Staff, following the forced resignation General Pratts by pro-coup conspirators. Moreover, when sections of the rank and file tried to come to the aid of the revolution and oppose a coup, the policy of “constitutionality” meant Allende scandalously supported the pro-coup reactionary hierarchy. In August, in the naval port of Valpariso, 100 sailors were arrested for “dereliction of military duty”. In fact, they had discovered plans for the coup and declared they would oppose it. In what was referred to as his darkest hour, Allende, supported the hierarchy in the navy as it arrested and tortured this group of naval ratings! Up to one million people demonstrated in front of the balcony of the Presidential Palace, where Allende stood, two days before the Pinochet coup. These workers, youth and students, knowing of the impending coup, demanded arms to defend the revolution. They also demanded the closure of the bourgeois parliament. The left-leaders of the PSCh and others promised arms were being stashed and would be distributed when necessary. In reality, nothing was done to arm the working class against bloody counter-revolution. Two days later, the plotters struck, as the Chilean and US navies conducted joint exercises off the Chilean coast. On the day of the coup, the trade union federation, the CUT, called on workers to go to the factories and await instructions. This wrong policy was justified by misquoting Lenin’s reference to the factories as the fortresses of the revolution. It was in marked contrast to the heroic workers in Barcelona, in Spain 1936, who when hearing of the fascist revolt immediately went onto the offensive and stormed the military barracks and defeated the fascists. In Chile in September 1973, a mass armed protest and clear appeal for the soldiers to join the revolution was the only prospect at this late stage to save the revolution and defeat the coup. Instead, as the coup unfolded, workers were left isolated in their factories, waiting to be picked off by armed detachments of the army. Once in power, the military unleashed a bloody era of repression and slaughter. More discriminate in its execution than the coup in Argentina and other Latin American countries, it was a ruthless clinical operation which targeted the most politically conscious and active workers and youth. While more were killed in Argentina’s “dirty war” the conscious picking out of political activists and local workers’ leaders beheaded the workers’ movement. Amongst those slaughtered during the early days of the coup was the revolutionary Chilean folk singer, Victor Jara, who was rounded up along with thousands and taken to the Estado de Santiago in Santiago. The coup was accompanied by the arrival of the ‘Chicago boys’ – a team of right wing economists – and the unleashing of neo-liberal policies which have had a devastating effect of the Chilean working class. The military regime lasted until 1990. Unfortunately, the leaders of the Socialist Party and the Communist Party did not learn from the lessons of this bloody defeat. With the collapse of the former Stalinist regimes and planned economies, they abandoned any defence of socialist ideas and formed yet more alliances with what they regard as ‘progressive’ sections of the Chilean ruling class. For twenty years, since the end of the military rule and ‘transition’, the PSCh has been in an alliance with the Christian Democracy and ruled in the governing coalition, Concertacion. In government, the PSCh continued with the policies of privatisation and neo-liberalism. The Communist Party has tried to act as a ‘left’ adviser to the Concertacion coalition, hanging onto its coat tails, desperate to try and secure a few parliamentary seats, as a reward. At the last election, the Communist Party finally succeeded in being granted three seats! The Chilean economy has been held up as a model throughout Latin America and globally. The economic growth, which has averaged more than 5.5% per annum, has been used to justify the extreme neo-liberal policies begun under the military regime and continued since. It has been based on a high and rising price of copper, which accounts for 15% of GDP, and export of timber, wine and agricultural produce. However, despite the growth, Chile has also become one of the most unequal societies in Latin America – one of the three most unequal throughout the continent. This has resulted in an increasingly explosive social situation, reflected in the tremendous struggle of the hundreds of thousands of youth in recent months. At the same time, the victory of successive Concertacion governments during the last twenty years, which have only acted to defend the interests of the rich, has resulted in growing political alienation from all the political institutions bequeathed by the dictatorship. All of the main political parties have defended the same or similar policies. The electoral system, set in train by Pinochet, is designed to maintain the two main political blocks, in almost a deadlocked parliamentary system. The so-called ‘binominal’ system – designed by Jarulselski in Poland- makes it impossible for any party to get elected, if it is outside the two main blocks – the “centre-left” of the Concertacion or the far right. The alienation from the political parties that have all defended the economic and political system is reflected in a low level of electoral registration by young people. Around 75% of youth voters do not even register to vote. The absence of any alternative, and dissatisfaction with the Concertacion, resulted in the victory of the right-wing coalition headed by Sabastian Pinera. Like most of the leading political caste in Chile, he hails from a family dynasty. His elder brother was a minister under Pinochet and his father was the Chilean Ambassador to the UN between 1964-70. The Pinera election victory acted as a whip of counter revolution and unleashed all of the frustration and alienation which has been accumulating for the last twenty years. A new generation has exploded into struggle, marking the end of the so-called “stability” boasted of by the Chilean ruling class since the end of the military dictatorship. For months, the university and secondary school students have occupied universities and schools, held massive demonstrations of hundreds of thousands, ‘kiss-ins’ and other forms of protest to demand a free and decent education system. They have confronted vicious state repression not seen since the days of the dictatorship, resulting in the killing on one 16 year old youth. This youth movement enjoyed massive support amongst the population – according to one opinion poll, 85% supported the students. During the movement, the copper workers called a one day strike with the support of the students. Significantly, this strike was called on 11 July – the same day Allende nationalised the copper industry. Dockers and other sectors of the workers declared their support. The students also took up the demands of the copper workers and called for nationalisation of this sector of the economy. There were similarities to France 1968, when students in revolt were joined by the working class. However, there were also important obstacles and difficulties to overcome in Chile, some resulting from the legacy of the dictatorship, others reflecting difficulties facing the working class today and the effects of a bankrupt trade union leadership, as well as the application of neo-liberal policies. The students looked towards the workers and organised rallies and protests in support of the copper workers. Yet the union leadership dissuaded workers from attending such rallies. Reflecting this massive pressure, the CUT union federation was compelled to call a two day general strike on 24 and 25 August. However, this opportunity was squandered by the leadership of the CUT. For twenty years, the CUT leadership has acted as an appendage of the Concertacion. The youth perceive the CUT as just another institution of the system. To simply call a strike from above is not sufficient. With no campaign in the work places or local communities to prepare the workers and boost their confidence and without a clear plan to defend victimised workers, many workers felt intimidated to take action. The consequences of neo-liberal policies mean that the preparation of a strike is even more important. In the private sector, many workers do not even have a contract and work on a daily or hourly basis, fearing they could easily loose their jobs. Even in the public sector, an estimated 50% of workers have no contract. This makes the job of building effective trade unions even more difficult. Teachers, for example, are dubbed “professores taxistas” – ‘taxi teachers’. They teach for a few hours in one school and then rush off to another for a few hours and have no contract, at all. As a result of these weaknesses, and a union leadership that is not prepared to fight, the strike had a limited impact despite enjoying massive sympathy from the mass of the population. The building of committees of struggle in the work places and assemblies in the local communities is a crucial task and part of the rebuilding of the workers’ movement, which is now urgently posed in Chile, as in other countries. The role of the political parties, including the Communist Party, was another feature of this movement. The alienation of young people towards the system and institutions was reflected in a very pronounced reaction against the idea of political parties. The Communist Party, which has acted as an appendage of the Concertacion, and which even runs its own private university, is viewed in a similar light! The role of the Communist Party re-enforced the anti-party mood, which was also present in the recent youth movements which erupted in Spain and Greece. This has not meant that the movement is “apolitical”. The youth in Chile demanded nationalisation of the copper industry, free and decent education, as opposed to the idea of education as a “commodity”. However, they reacted against the idea of a political party because they have had no experience of a party which is different and which they regard as representing their own interests. While this was a complication in the movement, it represents the first reaction of a new generation which has just moved into struggle for the first time. It is a temporary reaction to the political parties and system which already exist. An organised force, a new political party, which can channel the determination of the new generation to fight for a change and which has learnt the lessons of the previous struggles, is posed objectively in the struggle and in the crisis which is developing. Through the experience of further struggles and battles, significant layers of those entering struggle for the first time can begin to draw the conclusion that they need to build a new force and party which represents their interests. Marxists need to assist this process by drawing on the experience of previous struggles and explaining what a genuine party of the workers and youth would fight for and how it would be different to the existing parties that defend the system. New class battles loom in Chile. Remembering the first 9/11 and drawing the lessons from this bloody defeat, can assist the new generation to prepare for class struggles to be fought and also prepare the way to overthrow the capitalist system and usher in a genuine democratic socialist alternative.